Three Tides, a Belfast bar and eatery that has become a local institution, is for sale. Three Tides and Marshall Wharf Brewing Co., two iconic Belfast establishments that have helped usher in the craft beer wave and remake the city’s waterfront, are for sale. Owners David and Sarah Carlson, who have spent the past 19 years building their businesses from the ground up, said this week they are ready to do something new. The next step for Three Tides, a cocktail bar and eatery that is perched on the edge of the harbor, and Marshall Wharf remains unknown, the Carlsons said. 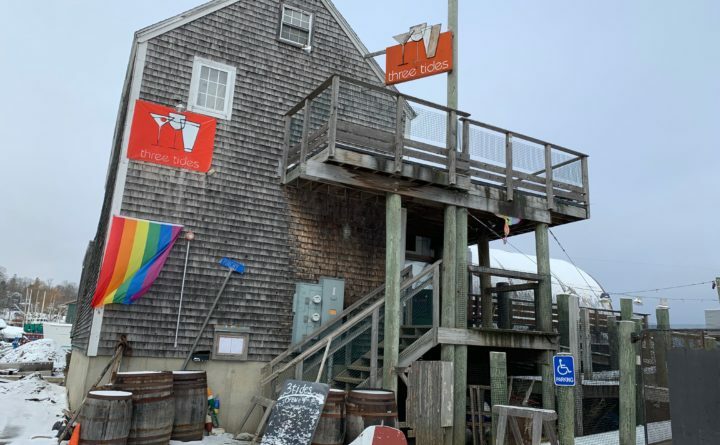 The businesses will stay open as usual for the time being, but are actively being marketed for sale, initially to large brewery owners that might be interested in purchasing them as connected turnkey operations. “A brewery supporting a bar in that setting is perfect,” David Carlson said, adding that he will be meeting with several brewery owners this week. If they don’t find any buyers who are able to meet their $5 million asking price, they will move on to plan B, with an end date in mind. David Carlson said he would like to move away from running Three Tides and Marshall Wharf by July of this year, when he turns 50. In 2000, David and Sarah Carlson moved home to Maine from Wyoming to see if they could find the right place to open the cocktail bar they had dreamed up. After scoping out locations all over the state, they knew right away that two derelict 19th century buildings in a quiet part of Belfast Harbor would fit the bill: the former city granary and the boat barn next door. Then they got to work, first opening the granary as a lobster pound, which they ran while they were renovating the other building. There was a lot to do. Wayne Marshall, the director of code and planning for the city of Belfast, said that he was stunned when the Carlsons first talked to him about their desire to resurrect the boat barn and turn it into Three Tides. 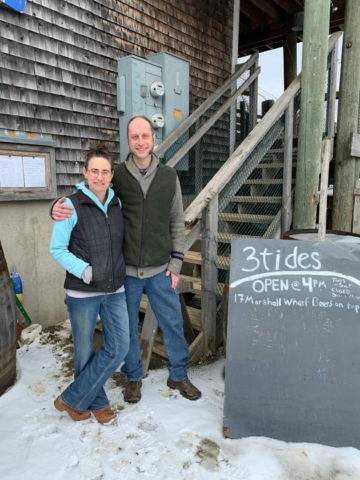 David and Sarah Carlson opened Three Tides in Belfast in 2003 and the Marshall Wharf Brewing Co. next door in 2007. They are putting their businesses, called local institutions by one city official, up for sale. But he learned that the Carlsons had the kind of grit and imagination necessary to overcome those challenges. The Carlsons had envisioned a particular kind of place, and held fast to the vision as they readied the building and poured the long, curvilinear concrete bar for their customers to sit around when it opened in August 2003. The bar was tucked away in a quiet corner of the waterfront, and at first was a bit under the radar. But as people found them, many shared their opinions about what they wanted. As they expanded Three Tides to an outside deck and a large beer garden by the harbor, complete with a chiminea, a bocce court, and space for bands to play and movies to be shown, they also grew their family. Daughters Luna, 13, and Story, 11, lived over the restaurant when they were little and have spent a lot of time there over the years, Sarah Carlson said. “For years, I’d have one of them on my back while I was cooking,” she said. “I’d make cocktails with Luna asleep in one arm,” her husband added. More growth happened in 2007 when the couple opened Marshall Wharf Brewing Co., the 25th brewery to open in Maine (currently, there are more than 100). Marshall Wharf was able to carve out its own niche, the Carlsons said, and with the initial help of Maine brewmaster Danny McGovern, focused on brewing strong beers with unusual flavors, such as the Pemaquid Oyster Stout, made with oysters, and Sea Belt Scotch Ale, brewed with Maine-grown sugar kelp. They kept the brewery small, last year brewing just 400 barrels. Most of it is sold at Three Tides and at the brewery, although they do sell cans elsewhere. Sean Sullivan of the Maine Brewers’ Guild said that David Carlson has long been an important part of the Maine beer community. Sullivan, who worked with David Carlson to bring the Maine Beer Box idea to life, counts himself among those who would miss Three Tides if it closes for good. If no one steps forward to purchase the businesses as a package, the Carlsons are willing to split them. They can easily imagine a scenario in which the Marshall Wharf Brewing Co. building, which has flooded many times over the years, needs to be torn down. It would take a lot of work and money to lift and fix the old granary out of the flood zone (Three Tides was lifted in 2003). Right now, flood insurance costs $24,000 per year, and their premiums are expected to increase as ocean levels rise. “In all reality, it’s a tear-down,” David Carlson said. If a purchaser wants to take the brand and move the businesses elsewhere, that would be OK, too. Then the Carlsons will have their two waterfront lots to play with, and David Carlson, ever an entrepreneur, has an idea for that space. He dreams of making it a ferry terminal for high-speed, Norwegian-designed and Maine-built boats. To make this a reality, he envisions working with private businesses, the University of Maine, Maine Maritime Academy, state government and other entities. But that’s down the road. In the short term, both Carlsons are looking forward to catching their breath and taking a break. It will be bittersweet to leave Three Tides behind, they said. “There are so many stories,” Sarah Carlson said, ticking off the names of people who married after meeting while working at Three Tides and local businesses that got their start there, such as the Neighborhood restaurant. She talked about strangers who became friends that feel more like family and a sense of community that is just as strong in winter as it is in the lively, crowded summers. She and David Carlson said they owe a lot of thanks to their families for believing in them and proudly named one beer, “Phil Brown Ale,” after David Carlson’s stepfather. They also were grateful for Belfast officials who worked with them as they turned their quirky dream into a reality. Marshall, the director of code and planning, said that what the Carlsons built has become a Belfast institution. But it’s time, the couple said. “Life had become unmanageable,” David Carlson said. Hopefully, Sarah Carlson said, that will change.